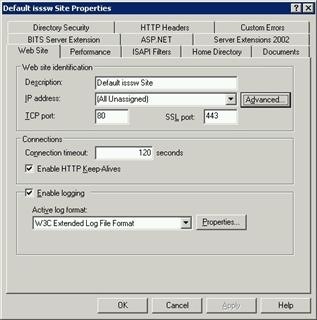 In IIS, on Windows Server 2003, multiple sites with multiple ports are used in most deployments. 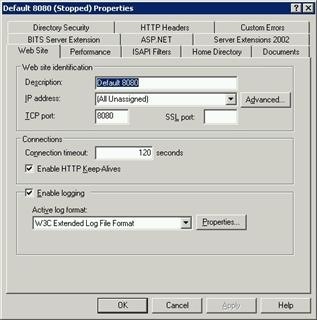 For example, if two sites are configured, one with port 80, the other with port 8080, they would appear as follows in the IIS administration tool. 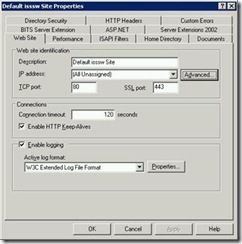 In IIS admin, the port value and the host header value can also be set under the advanced settings. If one wanted an MSI package to install a Web Application by default on the site that used port 8080, and the virtual directory to "TestWeb", Visual Studio 2003 made this easy. Set the VirtualDirectory Property to "TestWeb"
If one wanted to pass this as a command line parameters the MSI these MSI properties could also be set. The property TARGETDIR can also be used to specify the physical path where the application should be installed. The problem with this approach is that the site will not be the same number on every server. We can use this approach to know what site number is used based on the port number assigned to that site. We can use the algorithm noted below in a VB script to find the server number and use the update the TARGETSITE on the command line. IISObjectPath = "IIS://" & MachineName & "/W3SVC"
' Gets the Port Number of the current IISObject.
' the application is installed.
' Err.Raise 9999, "FindServerNum", "No Active Servers with the requested port were found. Port=" & strPort &  ". " A copy of the script can be downloaded MSIInstallScript.zip. If you follow the basic line of logic from the article at Walkthrough: Passing Data to a Custom Action then getting the TARGESITE value is fairly simple.
' Gets the parameter passed across in the CustomActionData. If you run the following command, you should see a message box that appears showing the SITE value. So now we have read it, we should be able to set it. Actually, this is misleading, you can’t set the TARGETSITE. Ok, you can, but by the time you set it, the TARGETSITE has already been established and so setting it is a moot point. If you actually run this, you will see there are two problems with this approach. First, the component that executes the custom action actually gets installed in the TARGETSITE and TARGETVDIR. Second, since the TARGETSITE has already been set in the User Dialog or Acquisition or User Dialog phase of gathering the data to set the properties for the installation. The Windows Installer goes through a series of sequences for the MSI package: Initialization; User Dialog; Finalization or Rollback. A full explanation of these phases is best explain in the article Installation Phases and In-Script Execution Options for Custom Actions in Windows Installer. Essentially, this is a chicken and egg problem. One can’t set the property in the custom action because by the time the custom action is invoked, the property for TARGETSITE is already set. Phil Wilson also explains the same sequencing problem in his article Visual Studio Setup - projects and custom actions. Essentially if you have to solve the problem of installing an application on a site with a specific port, there are two options. Set the TARGETSITE property and pass this as a parameter prior to invoking msi install, or moving to another tool like Windows Installation Studio 7 by Wise (aka Altiris) or InstallShield from Marco Vision. These products allow the creation of dialog windows which can be customized with further custom actions and logic far beyond what the Visual Studio 2003 or 2005 products allow. 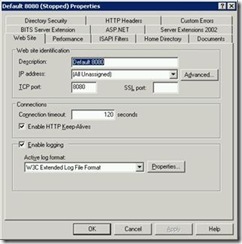 Custom Installer Actions: Edit Connection Strings, IIS Directory Security Settings, etc. How do I set property in Custom Action?